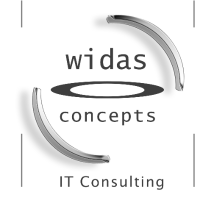 The innovative IT consulting company WidasConcepts supports its customers since 1997 in successfully shaping their business processes. WidasConcepts develops modern and future-oriented concepts in the areas of Big Data, Internet of Things, as well as mobile and web-solutions. WidasConcepts aims to create intelligent business solutions to enable Businesses win in the competitive market. The company is headquartered in Wimsheim, Germany and branch office in Bengaluru, India. WidasConcepts has currently 90 employees and is a member of the high-tech Association BITKOM.